The joint signing of a Co-Action Plan by the Mondulkiri and Dak Lak provincial governments on the 29th January 2018 signified the beginning of a long-awaited cooperation between Cambodia and Vietnam to protect the natural resources that span the contiguous landscape. 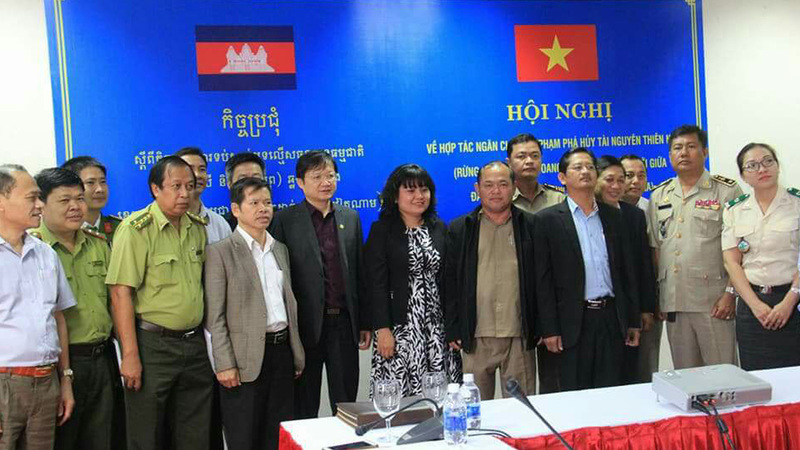 In the terms of the cooperative agreement, Cambodia and Vietnam will focus on putting a stop to forest and wildlife crime along the border between Cambodia’s Mondulkiri province and Vietnam’s Dak Lak province. Both provincial governments will be able to establish an effective trans-boundary mechanism to facilitate the sharing of information between patrol teams and strengthen cooperative patrolling efforts to reduce the opportunity for natural-resource related crime to occur. It has long been agreed that transboundary cooperation is necessary for effective patrolling, and with the combined efforts of both countries, the skills and techniques employed by the different patrolling units can be shared. WWF is integral in facilitating this exchange, providing capacity building in areas such as natural resource management, wildlife surveillance through installation of camera traps and sharing information on tactics that can be employed. The combined effort of both provinces will provide a greater degree of protection to these contiguous protected areas, the strength of which would not be possible without collaborative efforts. In addition, both countries will continue to increase awareness outreach activities to local people in Mondulkiri and Dak Lak province in order to actively involve them in natural resource protection efforts. This work will include the promotion and development of ecotourism programs which will in turn increase the income of communities, subsequently improving their livelihood and contributing to the two provinces’ economic development. The pressure on the natural resources along the border between the two provinces is increasing, due to a rise in residents and migrants living in and around the area. Loss of forest cover and encroachment on previously uninhabited forest, combined with illegal poaching and snaring has resulted in serious threats to fauna and flora. Illegal logging of high value "luxury" timber threatens to degrade patches of semi-evergreen forest that form critical habitats for wild cattle, elephants and other endangered species. Local consumption and poaching for domestic and international wildlife trade is the greatest immediate threat to wildlife in the dry forests. Signing of the Co-Action Plan between Cambodia and Vietnam provincial governments is promising news and builds hopes for a future population increase of the endangered species in both countries, and for continued forest protection.